I used to absolutely dread my Wednesday Weigh-ins, which is part of the reason I stopped doing them for a couple of years. But now that I've gotten so consistent with my eating, I don't dread Wednesday mornings at all. Even seeing a gain (a normal fluctuation) doesn't bother me, because I know that I am being consistent with my eating habits. 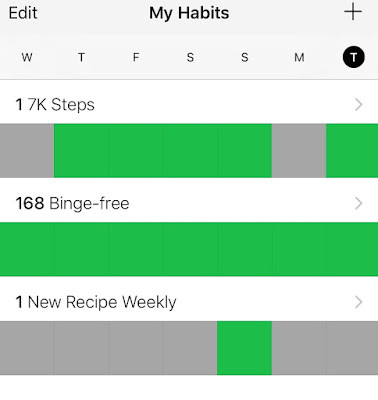 7K steps 6+ days per week: I only managed five days this week. The weather turned, and it has been such a BITTER cold this week. I'm not making excuses, though--I just really didn't want to go for a walk in the cold on my rest days! Stay binge-free: Success! Today is day 169 of my binge-free streak. I love love love feeling in control over food again. My longest streak ever was 365 days, so I'm going to try and beat that. The second recipe I tried was for Apple Cinnamon Baked Oatmeal. We had this for dinner yesterday, and it was delicious! I thought my kids would complain the entire time about eating oatmeal (especially for dinner), but they actually really liked it. Eli even had seconds. The only change I would make to this recipe is to cut the amount of salt in half. It tasted pretty salty to me (and I happen to love salt!). But I would definitely make this again (Eli has requested that we eat it often, haha). 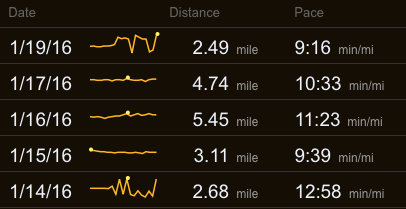 My 10K training went pretty well this week, too, except for yesterday's run. I was doing my 5 x 4:00 intervals, and got a severe abdominal muscle spasm--I really wish I knew what was causing these! I couldn't run (it hurt to even walk), so I hobbled home. I only made it through two and a half of the intervals. 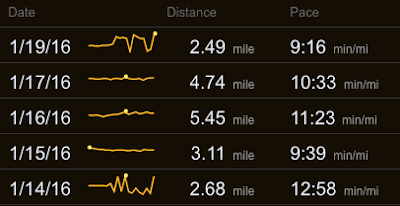 I was bummed, because I was doing really great with my speed (7:32, 7:35, 7:06). These ab spasms are new to me, just occurring since October. They don't happen all the time, but when they do, it's usually during a hard workout (intervals or tempo). I've been reading what I can find about it, so I'm going to start noting when they happen and see if I can find a pattern as to what is causing them. I've answered this question before, but I am still getting several emails a day asking the same question--so I'm going to post it here, too. FAQ: How did you determine the number of calories you eat per day? Answer: I didn't. I never set a goal for the amount of calories I would eat--I just started logging my food, eating three meals and one "treat" a day, and it ended up working out to being about 1500-1600 per day. That was enough to keep me from being hungry and to fuel my runs, but also able to lose weight. When logging my food, I just wanted the total calories to be "reasonable"--but I didn't (and still don't) aim for a particular number or range. I think the best way to find out how many calories to eat is to experiment! Pick a number, and try it for a week--if you lose weight and feel good, awesome. If not, try a different number. When I first started counting calories, I had no idea how many would work for me. I knew I wanted to be able to eat as much as possible, but still lose weight. So, I just started eating what felt like a "normal" amount of food, and it worked out to be around 1500-1600 calories on average. In maintenance, I've been eating more than that, but I've still lost another five pounds. The way I've lost the weight is truly as simple as it could possibly get--counting calories. I don't look at the macronutrients (fat, carbs, protein), or anything else. I wanted to go back to the basics and keep it as simple as possible. So, I just eat whatever I want, and I log the calories for it, trying to keep it "reasonable". I wrote a FAQ post about the calorie counting, which you can find here, so that answers more questions. The oatmeal looks so good! I may have to make it this week. Great job on maintenance! I tried a similar shrimp scampi recipe last week, and came to the same conclusion.....too much lemon!! Congratulations on your binge free streak. I have trouble with binging and I know how hard it can be. You sound very happy again. Thanks for sharing. Your honesty helps me be honest with myself and I am on track again. Thanks. RE: getting in your steps--have you thought about taking a walk on your treadmill? I do that when it's too cold out on my non-running days. I'd rather walk outside, but who wouldn't? I set the speed for 4.2 and put it on a slight incline, watch something fun, and end up working up a pretty good sweat! Excellent weight maintenance! That's the real goal isn't it? I will get there some day. Question about your maintenance. Are you still as active as you were when you were lost 125 lbs AND is your calorie intake less or more? Just curious because I've heard some people say that they had to stay even more active once they reached their goal and others said they just maintained what they did. I'm not sure I understand what you're asking... When I was losing the weight in 2009-2010, I didn't start exercising until I'd already lost about 60 pounds. My weight over the last five years hasn't run parallel with the amount of exercise I've done--exercise really doesn't affect my weight at all, so I don't exercise for weight loss. The amount of exercise I do depends on what I'm training for. Over the last five years, I've done anything from three short runs per week to running 50 miles a week, to not running at all due to injury. Amanda, I totally understand. I was feeling impatient, too, and I think that actually sabotaged me. When I started counting calories, I went back to the basics, and I didn't care if it took me years to get back to goal--I just wanted to stop binge eating and stop the gain. When I finally had some patience, the weight melted off pretty quickly! Rebecca, thank you SO much--what a nice compliment! Yes, I've had to grow a thicker skin since I started blogging, but it's definitely worth it when I hear of other people getting inspired or having success with their goals :) Congrats on your weight loss! I just have to tell you, I LOVE this blog. 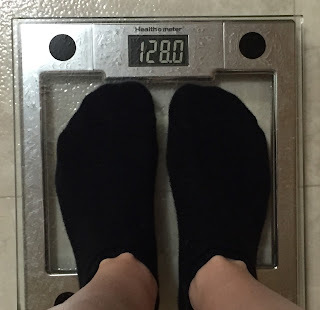 It is my favorite weight loss blog ever, and I've been on many! You will never know how motivating it is to log on here and read about your journey. I really appreciate that you are a Lifetime WW member, but found YOUR OWN way of losing/maintaining weight! I too am a Weight Watchers member, but I have tweaked the program to suit my own needs, and will continue to do so until I reach Lifetime status, like you. Please keep going with this blog! And while you're at it, I do believe you have a book in you! Write it and I will buy it! So many of us love reading weight loss success stories! Wow, thank you SO much for reading! I am so glad that you enjoy my ramblings :) I think it's great that you tweaked the program to suit your own needs--that's crucial to staying with it for the long term. Congrats on your maintenance! It seems like you're doing a great job at managing it all. I've also reached my goal weight a short while ago and I'm now working on maintaining it. Actually, I kept losing a bit after that and I'm slightly under my goal weight. It feels great. However, I found maintenance to be somewhat stressful. I lost by counting calories, and when I reached my goal I started to increase them slowly. Getting to eat more is quite nice and I appreciate it ... But! Part of me is always afraid to eat too much. I guess it'll take time for me to fully adjust mentally to *not* having to lose weight anymore. Congrats on reaching your goal weight! I know what you mean about feeling kind of stressed with maintenance. I reached maintenance once before, in 2012, and I worried so much about increasing my food intake. I think that ended up sabotaging me in the long term, though, because I still felt restricted. I ended up trying to eat intuitively, and gained 15 pounds right away. Now, I find that calorie counting is definitely what I need to do to maintain the weight loss, but I don't have any strict "rules" about eating, and I don't worry about it if I go overboard here and there. My main goal is to avoid binge eating! I used to get horrible, menstrual-type cramps sometimes when running, especially during hard workouts (intervals, etc). They were so painful! I never could figure out why, until I went to a PT for lower back pain while marathon training. He told me that I have crazy-tight hamstrings (probably from sitting all day at a desk job), which were causing me all kinds of problems, both the back pain & the abdominal cramps. They were so tight that they were pulling my abdomen forward while running. Now I do a longer warm-up & I stretch my hamstrings, especially before hard workouts. I'm not saying that is your issue of course, but it was a pretty easy fix so it's worth a shot. Oops! I meant crazy-tight HIP FLEXORS, not hamstrings. That certainly could be the case! When I was seeing the physical therapist, he said that my left hip was very weak, and that's what we were working on. The pain that I get isn't cramping, though--it's a sharp spasm, where my ab muscle gets extremely tight and hard. It's hard to even stand up straight when it happens! If it continues, I'll see a doctor about it. When you say "binge-free", what exactly does that entail? Is it not over doing it other than your high calorie day? I was wondering the same thing! It would be odd that it just showed up four years after surgery, though. Hopefully it goes away soon! Hi! Love your blog. I'm on maintenance too. It's much different than losing! I have a step goal too and when I have trouble getting outside I use Leslie Sansone in-home walking dvds or my rebounder which you can get for about $30 and it doesn't take up much room. Excellent job on all you've accomplished. We're all cheering you on!! !